What does sustainability reporting entail and how it helps businesses grow? In the 21st century, it is not enough to just say that our organization is sustainable and we are doing a lot for the environment and society. It does not work anymore, Increasingly all businesses and corporates are being asked to establish and demonstrate the sustainability strategy of their company as well as performances through credible and tangible evidence including performance data. There could be different ways to demonstrate companies sustainability commitment and the practices, however, the most common way is to demonstrate the same through publishing the sustainability report. Companies are seeking services of sustainability reporting consultant to prepare their sustainability reports, GE3S has been assisting several of its clients in preparing sustainability reports for years now. 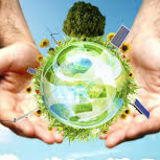 Do we need to follow a guideline or a prescribed pathway to prepare a sustainability report? Not at all, however, there are several guidelines and standards that have been developed to assist companies in reporting on sustainability issues. This is because several companies do not have enough capacity to understand what is important for reporting, collect data and report in a proper manner. Global reporting institute - GRI Standards are one of the most widely used sustainability reporting standards across geographies and sectors. GE3S is a sustainability reporting consultant assisting its clients to prepare sustainability reports in accordance with the GRI standards. reporting consultant and has prepared sustainability reporting for several companies and has also provided assurance services as a third-party verifier. 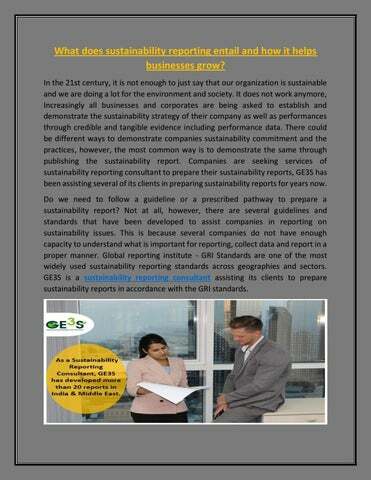 Please feel free to contact Mr. Vishal Kumar @ vishal.kumar@ge3s.org or call @ 045897399 for further information on sustainability reporting.